I was at an art opening recently – checking out the offerings, one of which was a table full of champagne, knives, and a roasted suckling pig – the viewer was invited to take a knife, help themselves to some yummy pork, then stab the table like a mad viking. And drink some bubbly. Who wouldn’t love that?. The venue was a cool hillside house deep in East LA – there was work everywhere, and performances as the sun set. One of the amazing things about living in Los Angeles is these independent expressions of artistic and curatorial exuberance that just bust out. It was super great. the run of the mill office cubicle, BUT - Space Cube has come to the rescue! While enjoying the afternoon, I was introduced to an artist, Stephen Wong (who works also works under the name of Dai Toyofuku), and we got to talking about his project called “Space Cube”. (It has to do with plants, and something about me gets people talking about plants. 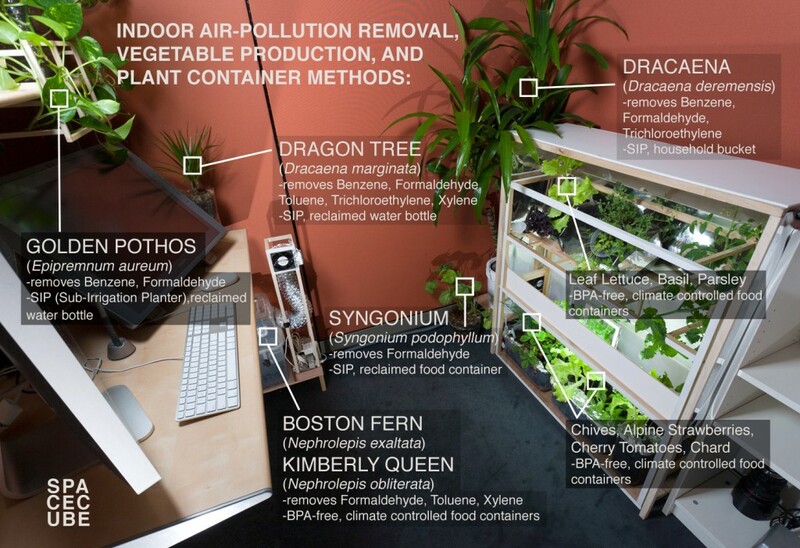 I wonder what that’s about) Wong creates modular “planting pods” that are specifically made to be used in office buildings by people stuck in cubicles during the work day. I’m pretty exclusive in my gardening practice – I am all about the glory of the world outside your back door (and front door! ), and I tend to see indoor gardening as purely decorative and slightly limited. I mean OF COURSE I know that there are reasons beyond the ornamental for bringing certain plants indoors, but in my personal experience it has never been as satisfying or interesting to garden inside. I’ve made terrariums, coddled ficus trees (which all die miserable deaths for mysterious reasons that get me all riled up), and grown plants that with wicked names like “Mother-in-laws Tongue” that are so boring in their potted isolation that they put me to sleep. The results of my indoor gardening efforts have always looked like a TGI Fridays in San Antonio, Texas. Eeeewww. shelving with grow lights and SNACKS ! Seeing the images of Wong’s project were exciting to me – here was a very simple, clear, and direct way to utilize the functional aspects of plants in a place where they can have an immediate impact. Most office buildings are “tight”, meaning they were built to minimize the infiltration of outside air to reduce the cost of heating and cooling. As a result, every bit of air in these energy efficient building is recirculated – including the dangerous volatile compounds off-gassed from carpets, office equipment, and chemical cleaning products. There is no way for anyone to stroll over and open a window to let in a breeze – the workers have to sit and suffer the assault of molds, formaldehyde and all matter of noxious ickiness. 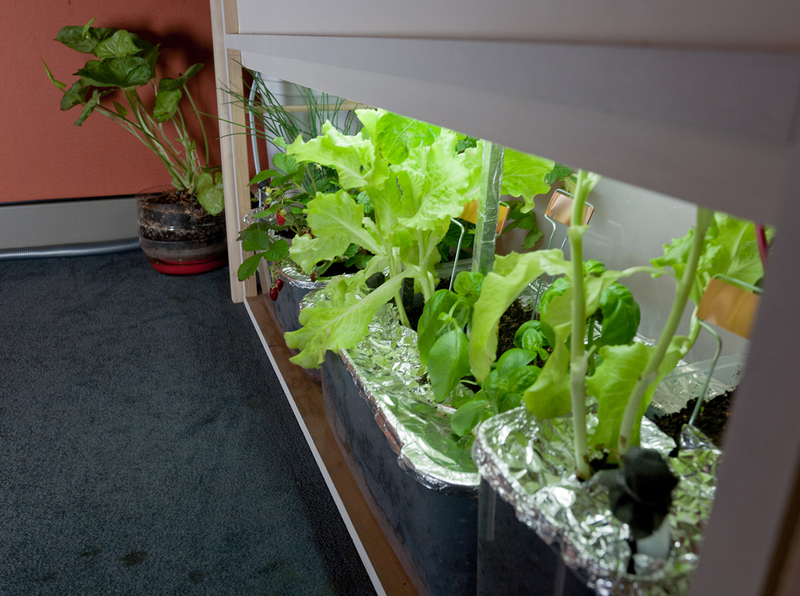 Wong’s project sites small plant growing units within an office cubicle. He uses plants that have been tested and proven to help clear the air of chemical compounds, then he directs the air flow to where it is most needed. 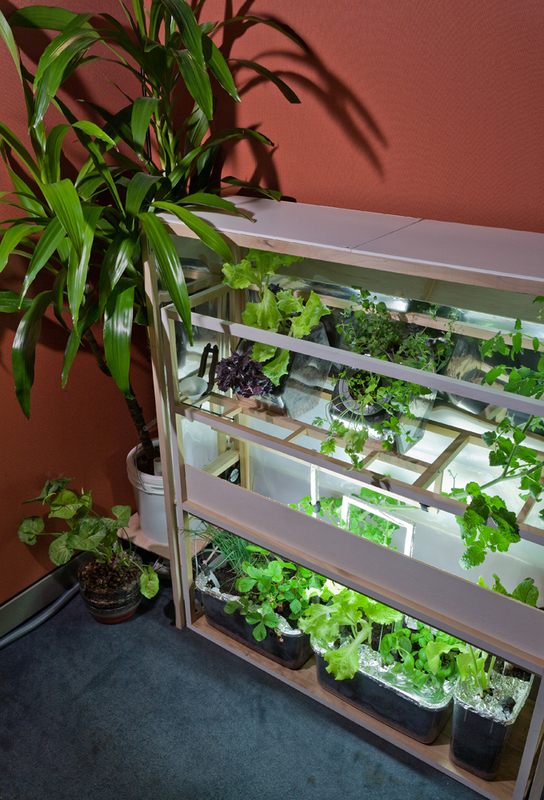 There are shelving units with grow lights mounted, and here you’ll find lettuces, herbs, and even strawberries. The worker in the “sick” building can grow their own healthy, organic snacks to avoid the dangerous pull of the candy machine. The containers where the plants grow are pleasantly hand made out of see through materials. All of the layers of drainage, the soil, and roots are visible. 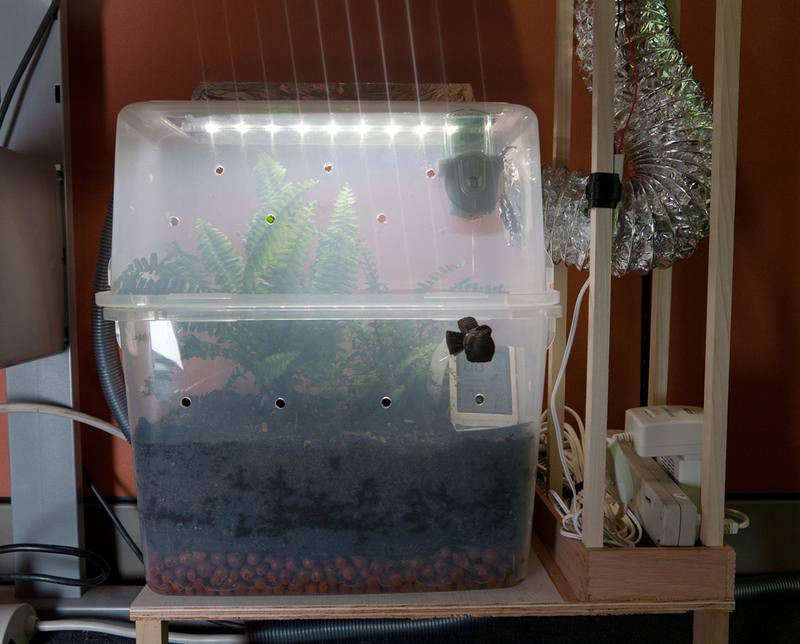 One planter is a closed box – a system which gathers the fresh oxygen released from a boston fern and emits it to the spot where the worker is seated at his/her workstation via a silver ventilation tube with a small fan attached. Like I said before, indoor planting is dominated by aesthetics. The straightforward, jerry-rigged way Wong builds his “machines” strips down the idea that plants are used to decorate and deals exclusively with the use value of the living material. 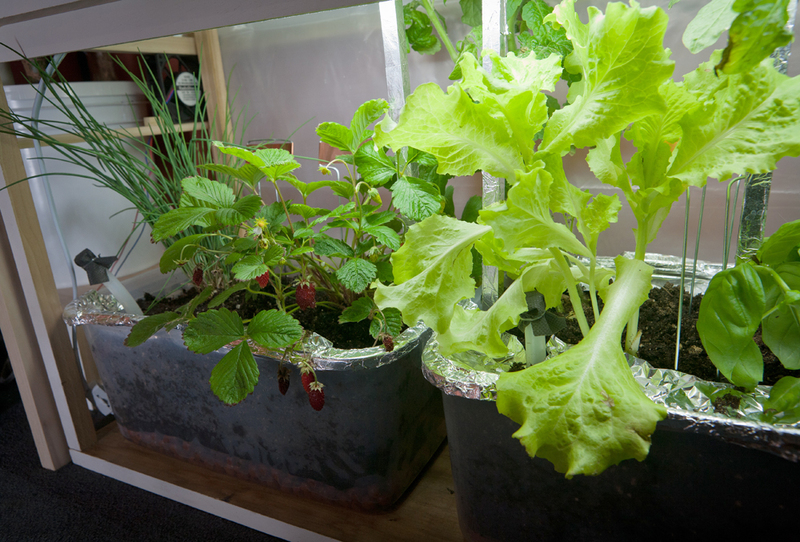 It has a no nonsense approach that brings an edge of the post-apocalyptic into play – the grow lights are eerie, the bins and buckets used to plant in seem trash-picked, and the crinkly shine of what looks like recycled aluminum foil lines some of the food containers. Who has time to think of “pretty” when the air in your office building is polluted and the food you buy is suspect as well? The movement towards sustainable living also carries with it a frisson of paranoia, which is nicely in evidence in Space Cube. strawberries! in an office cubicle! I revel in the place where art and issues of landscape collide. Artists like Fritz Haeg (Edible Estates, Animal Estates) and the Fallen Fruit collective open up their practices and create an inclusive, democratic place between critical thought and our practical, essential, day-to-day concerns with food and planted spaces. It is great to see another art practice moving forward and taking up these issues in a way that welcomes both art viewer and the lay person to join in. Wow I love this! I use to work in an office building like that and it was very boring and closed in. I love this idea. I work from home now and would love to know more about this so I could set something up in my office. Does he have a site?